Big Ideas has years of experience with installation of signs ranging from small interior jobs to high level signage requiring complex access equipment and fixing techniques. BIG haven’t yet come across an installation that can’t be done! 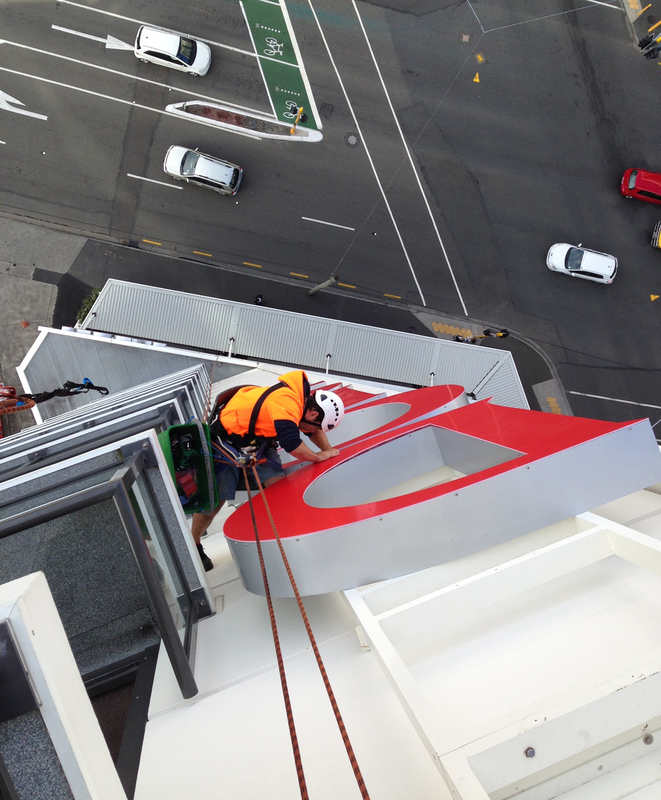 If you’d like to talk about your project please give us a call on 09 309 5495, or have a read about the issues to consider with signage installation. Health & Safety is vital component of our operating procedure. All staff are trained to operate within OHS guidelines, with all of our installers Site Safe accredited. We have all of the safety gear available (ranging from high-vis vests and hard-hats to harnesses and abseiling gear). 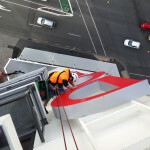 If you’re not sure quite how you want your sign installed, our installers will know the answer. There is a range of fixing types and techniques available to us. Wherever possible we will avoid unattractive ‘face-fixings’, and our account managers can inform you of the different options available. We have a certain degree of access gear available in-house, such as ladders, scaffolds and trestles. In a majority of cases this gear will suffice, however for larger jobs or tricky access situations we have strong relationships in place with suppliers of various access equipment such as scaffolding erectors, cherry-pickers, scissor/boom lifts and cranes. It’s unlikely you’ll be able to throw us a curve-ball we can’t deal with. Your job is to run your business. If you need a sign, that’s all we need to know and all you need to worry about. It’s our job to know (or research) local body signage bylaws and their requirements for street permits etc. When one of our account managers is looking at a project, they’ll make sure to review the area and consider issues such as working permits, council consents that may be required and any other legislative issues. You’ll be presented enough information prior to going ahead so you can make an informed decision, and most importantly understand what the added costs may be. In some signage installs it may also be necessary to close off the footpath and/or a portion of the road. We’re comfortable with these situations and have good relationships with traffic management companies who can help make it all happen. For larger projects, there is always a possibility that the council may have an opinion on the signage being erected typically when the sign is illuminated or is subject to building consent criteria. Immediately, your first thought may be to put the project in the too-hard basket and we understand this! Negotiating the ins and outs of council legislation can be mind-boggling! Instead, let us do the hard work for you. We’ll meet with council, ascertain their requirements, advise you of the potential costs, produce and collate the documentation then manage the consent process from woe to go! We’ll go so far as to deal with consulting engineers, electricians, lighting specialists and even your landlord!